Paper birch trees have a thin bark that peels in horizontal layers which separates into sheets, almost like paper. Birch trees can grow in pairs or clusters. There are many different types of birch trees and they all grow fairly tall. Both the sweet and paper birch can grow anywhere from sixty to eighty feet high. Some smaller types of birches are yellow birch, which grows anywhere from fifty to seventy-five feet, the river birch which grows anywhere from fifty to sixty feet, and the smallest yet, the gray birch which very rarely grows higher than forty feet. Birch nutlets are fairly small and grow in a cone. Birchesproduce long catkins (scaly spikes) which hold tiny flowers. The closed male catkins appear in the autumn, whereas the female ones dont appear until the following spring. 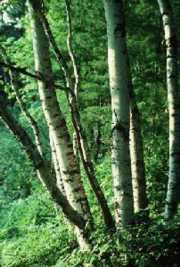 Paper birch or white birch was used by Indians to make birchbark canoes; therefore, it received the name, Canoe birch. Indians still make ornaments and small baskets of birchbark. Siberians collect the sap of the weeping birch to make syrup. Birch is a group of about forty trees and shrubs of North America, Europe, and Northern Asia. Paper birch grows in the taiga, or boreal forests, of Canada as far north as the tundra, and in the deciduous forests of the northern United States as far south as the Appalachian Mountains. The European white birch grows in northern Europe. The World Book Encyclopedia, volume 18, Chicago, World Book Inc. Pg. 809-810. The World Book Encyclopedia, volume 15, Chicago, World Book Inc. Pg. 667-668. The World Book Encyclopedia, volume 2, Chicago, World Book Inc. Pg. 327.